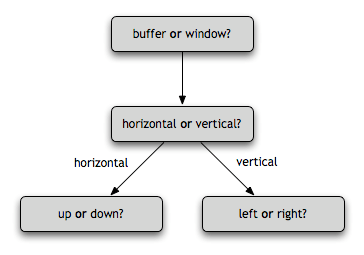 I think a good remember of the difference between buffer and window will be good too. I used them, but never really take the time to look and understand the difference! clarify what you’re saying. Well done. I think you are referring to what Vim calls a ‘window’. not be visible in any of Vim’s windows. with the terminology used by Vim. Ah yes … you’ve got me here. I’ll point an update to your comment. Indeed. I’m not even sure if ‘frame’ is the best choice of word to stand for a window from the OS, as opposed to Vim. Perhaps Vim’s “windows” should have been called “panels” instead. Anyway, the baggage of Vim’s terminology is older than certain operating systems, so we can hardly blame it. In response to yours and Drew’s discussion on what to call the whole thingamajig (i.e., a “window” from the GUI OS perspective), I think in the Vim world this is called a “screen”. Move the current window to be at the very top, using the full width of the screen. This works like closing the current window and then creating another one with “:topleft split”, except that the current window contents is used for the new window. This terminology is throughout the Vim documentation. I agree with @Drew. I think it would be better to update the article in order not to confuse people with customised terminology. Great article – could you also write about folds. It is a pain configuring folds – especially for ruby and python. Very well demonstrated. I’ve been using this as long as I can remember but never really thought about the frame vs. window. Thanks. More often than not, I re-arrange mine. If you’re viewing two opposing windows which are split vertically (top left arrangement in figure above), and you wish to view them horizontally (bottom left arrangement) then you can simply “push” the window by using CTRL_w-J (case sensitive). This action makes the current window the “bottom” most buffer. Respectively, CTRL_w-K performs the respective action of making the current buffer the top-most buffer. H and L push the buffer left and right respectively, turning a horizontal two-buffer arrangement into a vertical one. I’ve mapped it to CTRL_w-META_h, META_l, META_j, and META_k respectively (so CTRL_W, SHIFT_L makes this the right most buffer, but CTRL_W, ALT_L moves this buffer right one column). Since having done this I use it daily, hopefully you will find it useful as well. It would be nice if wordpress would let you preview comments. I managed to forget to escape the mapping commands. What a great article! Thank you for taking the time not only to explore this issue, but to share it with the community in such a detailed yet clear way. Before reading this, while I made heavy use of splits, I never really understood what was going on, and I did not understand why the splits I opened would open up the places and sizes that they do. This cleared it all up. That diagram is spectacular. An ASCII version should be incorporated into the Vim help/manual! The long intro of what the story ISN’T about kind of turned me off. And you did&7#821n;t really give much of a summary for what’s different about your story. The dad likes plants and they move around a lot. So, what’s changed? I’d be kind of interested in reading more if I knew it was going to be something with a good twist and character development.